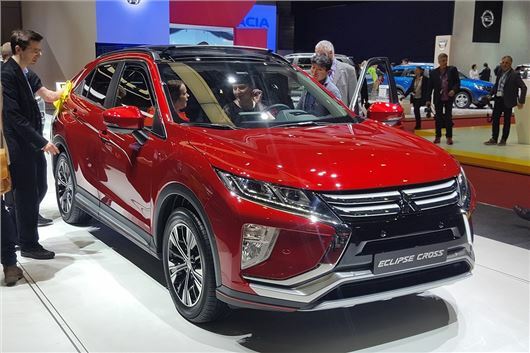 Mitsubishi has announced the Eclipse Cross at the 2017 Geneva Motor Show. The rival for the Nissan Qashqai is set to go on sale in 2018, with prices expected to start at around £19,000. Styling follows the current trend for Japanese SUVs – see also the Toyota CH-R and Honda HR-V – with a sharply angled rear screen and raised tail lights, which don’t bode well for rear visibility. The Eclipse will be available with a new 1.5-litre petrol engine and the existing 2.2-litre diesel already fitted to the Outlander and ASX. The former will be available with a CVT automatic transmission and the latter with an eight-speed auto. All-wheel drive will be available for tougher conditions. Inside, the cabin has a higher-end look than current Mitsubishi models, with a large infotainment screen on top of the centre stack and a touchpad controller reminiscent of the system used by Lexus in the NX and IS. Both Android Auto and Apple CarPlay will be available for linking up smartphones, but the more intricate details of specification and trim levels are to be confirmed nearer the car’s on sale date.